Jack is diving into the world of solids so naturally, I made my first baby food! I peeled, cored and chopped approximately two pounds of organic Bartlett pears that I found on sale for $1 per pound. Then I steamed them for 8 minutes until they were soft. 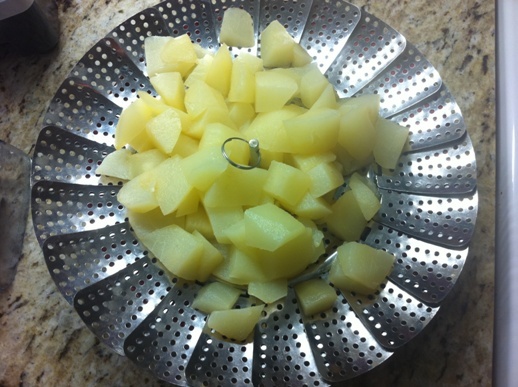 The steamed chunks of pear went into the blender and were blended into a puree. No additional liquid was necessary. 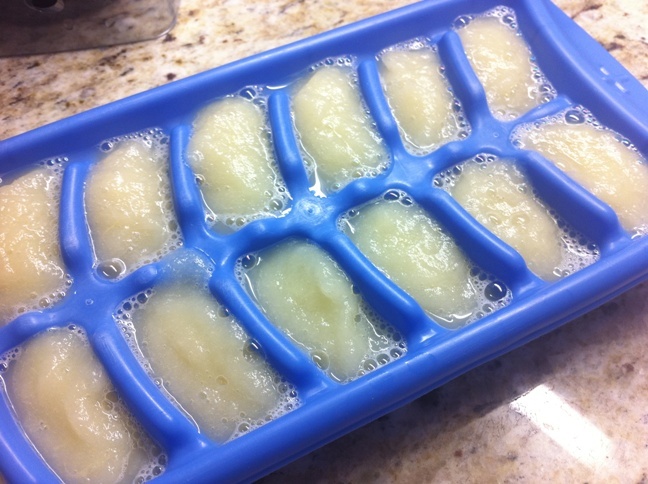 Then I poured the pear puree into an ice cube tray for freezing. Each cube is approximately one ounce. I also filled two jelly jars with approximately 3 ounces each. This batch of pears cost me $2 ($1 per pound for 2 pounds). I ended up with about 22 ounces of puree (16 cubes plus 2 jars with 3 ounces each). That means the batch cost me $0.09 per ounce to make, not counting my time. I can buy a 2.5 ounce jar of Earth’s Best organic pear puree for $0.69, which equates to $0.276 per ounce. Twenty-two ounces of Earth’s Best would cost $6.07, meaning I have saved myself $4.07 by making pear puree at home. It took me approximately 30 minutes to make the puree so this is equivalent to an hourly wage of $8. A little more than minimum wage but I’d say it’s worth my time, especially since cooking is something I enjoy. But something to consider is that I rarely ever find organic pears on sale for $1 per pound. They usually cost $2 per pound, on sale. Regular prices are even higher. If I had paid $2 per pound, my total cost would’ve been $4 and I only would’ve saved $2.07 overall. That’s got me shaking my head a little bit as that low of savings is not necessarily worth it to me. I have to admit I was surprised by this. I thought for sure making my own baby food would save me tons of money. As a working mom I have to prioritize my time and I’m not sure if saving $2 is worth 30 minutes of work. But what this exercise has shown me is where my price break is. 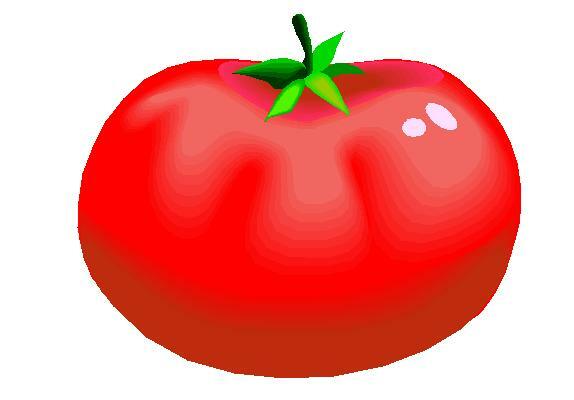 If I can find organic produce on sale for $1 per pound, it’s worth it to me to buy it and puree it. Two dollars a pound is a gray area while $3 per pound is probably not saving me any money at all. Now I can keep this in mind while shopping. Wholesome Baby Food has a nice page with a chart to compare the cost of homemade baby food to commercially prepared baby food. WBF also states that the cost savings is especially true as your baby moves into Stage 2-3 foods. Aha! So maybe we’ll need to perform this analysis again once we move on to combination and more advanced foods. I’m focused mainly on cost savings here, but are there other reasons to make your own baby food? WBF also has a page listing some great reasons to make your own baby food. What are your reasons for making (or not making) your own baby food? I think for us since the first foods I can puree at home and the first foods by Earth’s Best are pretty much the same thing, we’ll probably do a combination of homemade and jarred. Homemade at home and jarred food for day care. Once Jack starts moving into stage 2 foods I’ll start examining ingredients and costs and then reassess. I made almost all our baby food. I did buy some of those organic pouches because they were great to take on the go. I, however, do not work out of the house, and it was something I could do during naptime or whenever. Plus, we did mostly “baby led” eating, so we just let our kiddos try whatever we were having that was soft enough for them in very small pieces as soon as they could gum on it a bit. I didn’t realize there was a name for that…but as it turns out, that is exactly what I did with Addison! She was pretty uninterested in pureed baby food almost right away. Too nosy I guess 🙂 She always wanted what was on my plate, thus me just offering her something soft or something she could gum in her mouth. I admit that even though I didn’t plan it, it worked out well. Much easier when traveling too! I still keep things like Puffs and little freeze dried yogurt bites around for snacks but she has enough practice (and teeth) that I’m moving mostly to a small container of Cheerios or other similar things for snacks now. Otherwise, she has some of whatever we’re having for dinner! My encouragement for making your own baby food is that I feel the transition to real food is easier. With Andrew I made most all of his baby food, he was a great eater and loves all food. With Charlotte I didn’t have as much time and made less baby food and so she had more jar food. She is not as good of an eater. I also didn’t think that she transitioned as well to real food as Andrew did. She also tends to like more junk food than Andrew. Don’t get me wrong she still loves her veggies, but maybe not as much as Andrew. It could also just be that all kids are different but looking back I wish that I would have made more food for Charlotte.